Description: EMDX SD60 9098 on the BN at Cicero, Illinois on December 31, 1987, Kodachrome by Chuck Zeiler. Description: "Oakway" SD60 9022 leads a BN coal train south on the St Jo sub during the fall of 1994. 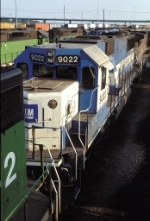 An SD60M trails. Description: A very starry night sits above an all-Oakway SD60 powered coal train. Description: Power plant in the background. Description: one of two DPU's on a taconite load. I have only seen two DPU's twice in my life on this line. Description: Oakway Leasing makes an apperance in Vancouver as the last unit of a grain train. Description: BNSF's Teague-Port train power sits at PTRA's Pasadena Yd.